After the discussion on the behaviour of a Spanish team has spread, here is a summary of the statements. This is the first time that a team is banned internationally from taking part in certain tournaments in Germany, Ireland, Sweden and the US. There are official statements from Setanta Ireland Jugger Club, over 60 Juggers of Germany (and other countries), Jugger Vancouver and some individual voices of tournament organizers. Of course, a statement of TE in the matter would be welcome here as well. Click on "read more" for details. Continue reading "Statements banning Tercios Españoles"
Update: Since creating this article, an extensive discussion on the topic has arisen both in local forums and on facebook, resulting in ban declarations done by players organizing tournaments. After incidents at the Deutsche Meisterschaft 2014, with an Irish shield player being injured and numerous reports of unfair an unsportive play on the side of the Spanish team Tercios Españoles, a discussion has arisen at the German Jugger forum about the team with over 70 entries right now -- this time not about their history of a fascist team name (historical discussion ⇒ here) but on sportsmanship. Now players prepared an open declaration to ban the team from German, and even other, tournaments. ⇒ Read it here. This is the first time a team get's banned from tournaments in a specific country. There had been only one ban of a team in the past in Germany, from one single tournament, and that was due to the heated history between them and the tournament's organizers. 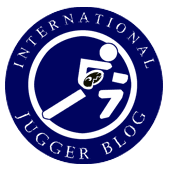 Addendum: Because of the facebook discussion on refreeing: To understand the uproar, it is important to keep the development of Jugger in Germany in mind (see Uhus books on the history of the sport). One core feature there is Fair Play. Not the soccer way (hurt them when the ref doesn't look) but real fair play: Jugger has long been a fun sport, with no need for extensive reffing. Now, where it begins to be more and more competitive, German tournaments are handling usually over 25, even over 40 or 60 teams at one single week-end. This means that a team that is not playing has to do the refereeing – it is simply impossilbe to have enough "professional" referees. Not having professional refs is considered positive by many players: More control can mean less personal responsibility, thus less fair play. And the need of playing fair is seen as a crucial treasure of the Jugger sport by some. Setanta Jugger club has published an official statement. The complete statement is to be found ⇒ at the German Jugger forum, here. Read on for more voices and statements in the next entry.